For my recent Italian dinner party, I made two sensational salads - Bill Granger's Rocket & Pumpkin Salad, pictured above, and Curtis Stone's Tomato Salad with Basil, Buffalo Mozzarella and Balsamic. Unfortunately, one of my guests was not a salad man, but I enjoyed the salads. It was a nice change from roast veges to go with my porchetta. Put all ingredients other than the rocket into a baking dish, toss to combine, and bake for 45 minutes or until the pumpkin is cooked through. 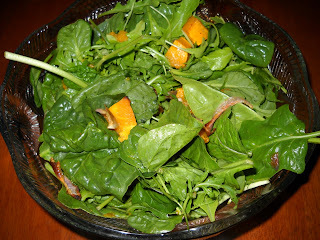 Put the rocket into a salad dish, add the pumpkin mixture, and toss to combine. It's that simple! Cut the tomatoes into 2-3cm pieces and place in a salad bowl. Add the basil and half of the balsamic vinegar and olive oil. Season the mixture with salt and pepper and toss to coat the tomatoes. 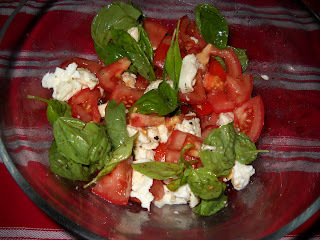 Scatter over the torn mozzarella, and drizzle with the remaining olive oil and balsamic vinegar. Enjoy! This week's Tuesday with Dorie takes us to the tea houses of Austria, but with the coconut flavour, it could just as well be from a tropical isle. 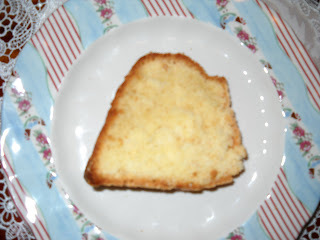 Our host is Carmen of Carmen Cooks, and she chose Dorie's Coconut Tea Cake. The coconut leaves a nice smell in the kitchen while it is baking. I made the straight up recipe, including the rum, although I think any of the variations would have been just as nice. Instead of shredded coconut, I used toasted dessicated coconut as this is what I had around. 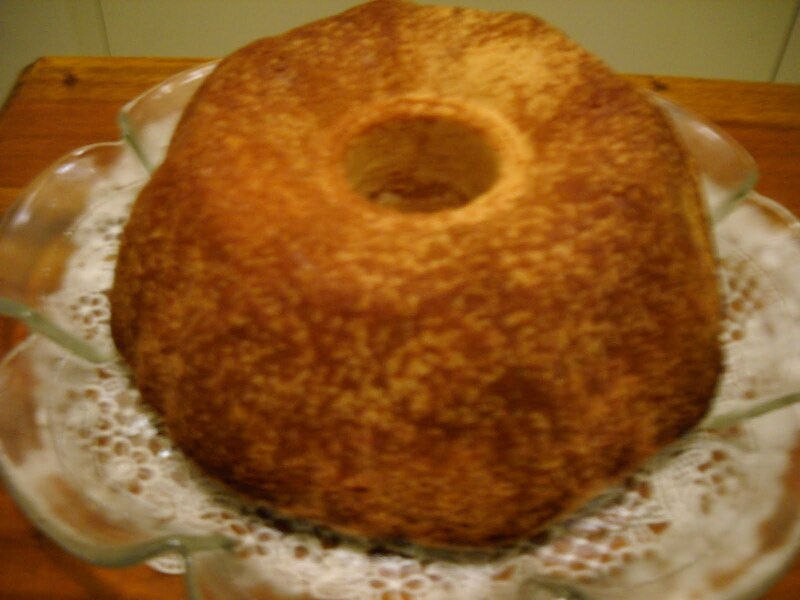 I would definitely make this again - it is a simple, easy cake, with a taste that is pleasant but not over the top. 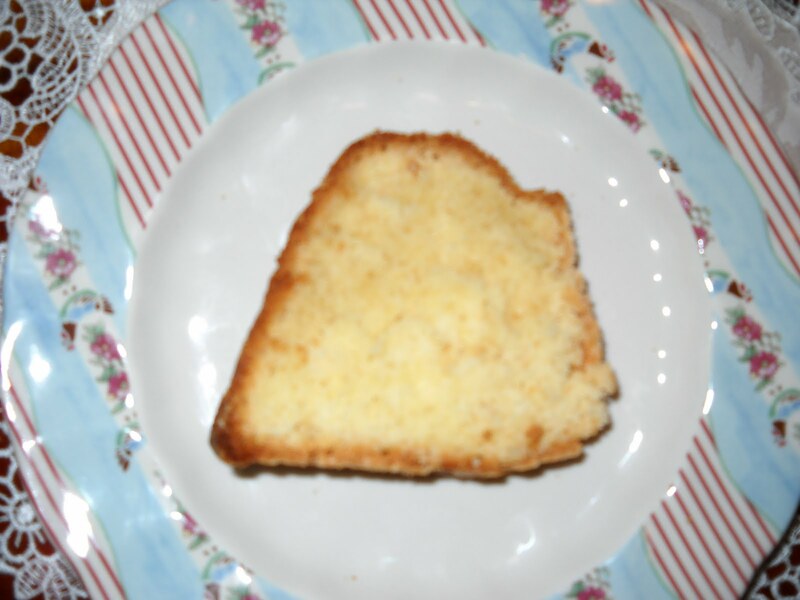 For the recipe for the Coconut Tea Cake, visit Carmen's site. 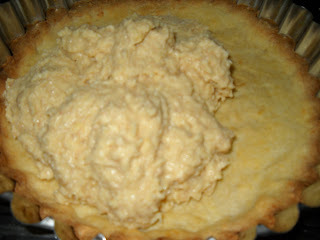 To see what the other TWD bakers though of this recipe, visit the TWD blogroll. Do you love entertaining friends? It is something that I don't do often enough, but I love the planning and effort that goes into it, and it gives you a real sense of satisfaction when it is done, especially if your guests has a good time and enjoyed the meal. Recently (ummm, well 4 weeks ago), I held a dinner party for my friend and her husband. It was around the time of the Daring Bakers tiramisu challenge, so the dessert was obviously going to be tiramisu. This made me decide to plan an Italian inspired meal for my guests. I pulled out all of my Italian editions of Delicious magazine, and came up with a menu. 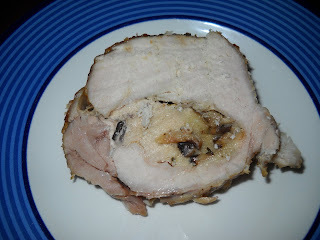 For the main course, I selected Jamie Oliver's recipe for porchetta stuffed with mushrooms from the May 2009 edition of Delicious magazine. As Jamie rightly says, it looks impressive but is not that hard to do. The price of the meat from the butcher kind of shocked me (it was twice as much as I had estimated in a telephone call with the butcher), but I took it on the chin, lesson learned, and really enjoyed this dish. The mushrooms enhanced rather than overpowered the flavour of the pork, and Jamie's gravy recipe really set the whole meal off. The crackling was also a highlight of the meal. Preheat your oven to its highest setting. Tear the mushrooms roughly. Heat a large frypan, add some olive oil for cooking the mushrooms, add the mushrooms and thyme, then the sliced bulb of garlic and butter. Fry the mixture for about 10 minutes until the mushrooms start to brown. Add the lemon zest, salt and pepper, then tip the mushroom mixture into a bowl to cool. Once cool, add the torn bread and toss together. If you have the pork bones, scatter them over the base of the roasting pan, and place the pork on top. 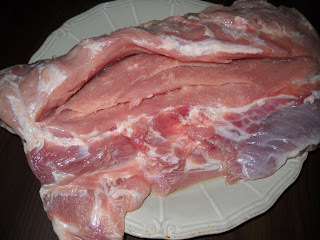 Put the pork into the oven and immediately reduce the temperature to 180 degrees Celsius. 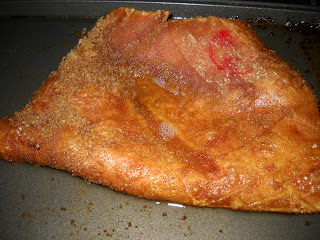 Score the surface of the pork skin into diamonds with a sharp knife. Crack open the fennel seeds with some salt in a pestle and mortar, then rub the mixture into the scored pork skin, and place it on a baking tray. 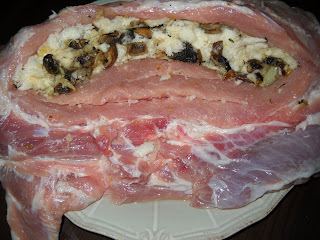 After the pork has been in the oven for one hour, remove it and add the vegetables and the remaining garlic bulb broken up into unpeeled cloves to the baking tray. 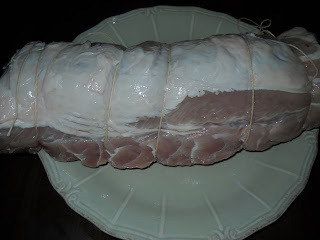 Pour the cider all over the pork, then return the pork to the oven and allow it to bake for another hour. Put the crackling into the oven at this stage too. When the pork is cooked, remove t from the oven and allow it to rest on a plate, covered with foil, for 20 minutes. 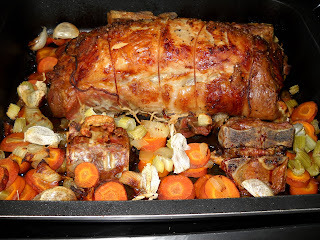 While the pork is resting, make the gravy by pouring the juices from the baking tray into a saucepan (with excess fat removed), mashing up the vegetables with a fork or potato masher, then adding the stock and the flour, and stirring over the heat until the gravy has reduced to the desired consistency. Sieve the gravy to remove the vegetable chunks and any flour lumps, and serve with the pork and crackling. The pork was appreciated by both my guests, and I would definitely make it again. I went to see Jamie Oliver Live in Melbourne a couple of weeks ago. Although I enjoyed it, it wasn't as much fun as when I saw him about 9 years ago in a more intimate venue. Quite a few people left well before the end of the show, which seemed to drag a little in a few places. I was also embarassed for a well known Australian pizza chain when Jamie rang up for a pizza live onstage and got more than a little attitude from the operator taking his order. If it had been me in real life, I would have told them to stick their pizza because the operator was so rude. A big hello to the lady from Malaysia who came on stage and was prepared to go to great lengths to get books signed for her friends and to find her daughter a husband. You go girl! 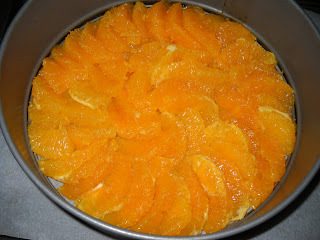 When I saw that this month's Daring Bakers challenge was an Orange Tian, I thought, "What the ...????" 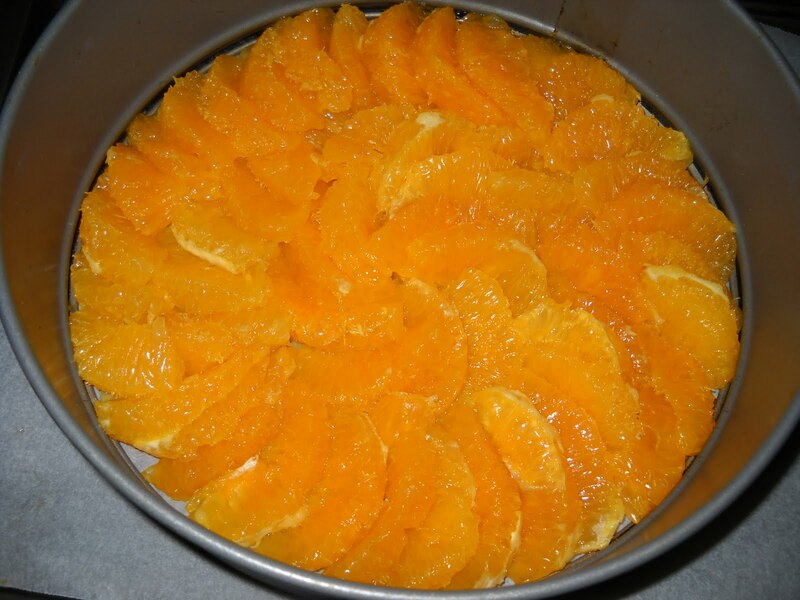 Perhaps I have been living in a cave, but I had never heard of an orange tian before, and when I read the ingredients, I wasn't initially enthused. However, after tasting the finished product, my mind was changed. 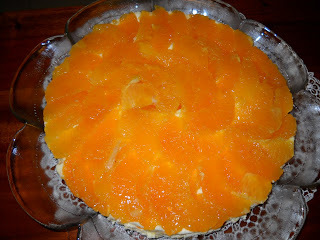 Basically, orange tian is comprised of a biscuit base, spread with home-made marmalade (a la Jaffa Cakes - one of my favourite biscuits in the whole wide world), then topped with orange flavoured whipped cream and caramel-flavoured orange segments and drizzled with orange-caramel sauce. I would never have chosen to make this of my own accord, and while I won't promise to make it again, I have to say that it is good. 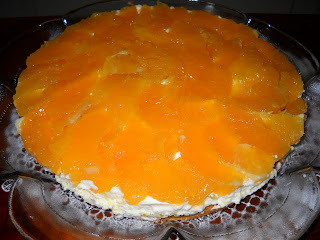 The zing of the oranges against the fluffy whipped cream reminds me of orange sherbert, and with the caramel sauce on top, this is a devine combination. Thanks for the link to the video on how to do this Jennifer - I would have been a little lost without it. My technique improved as I went along, but I also believe that some oranges were meant to be segmented, while others - well, not so much. 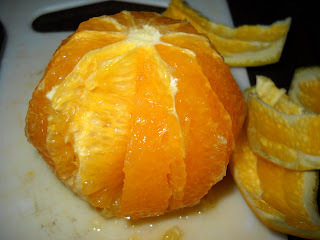 I ended up segmenting 6 and a half oranges for this dessert. 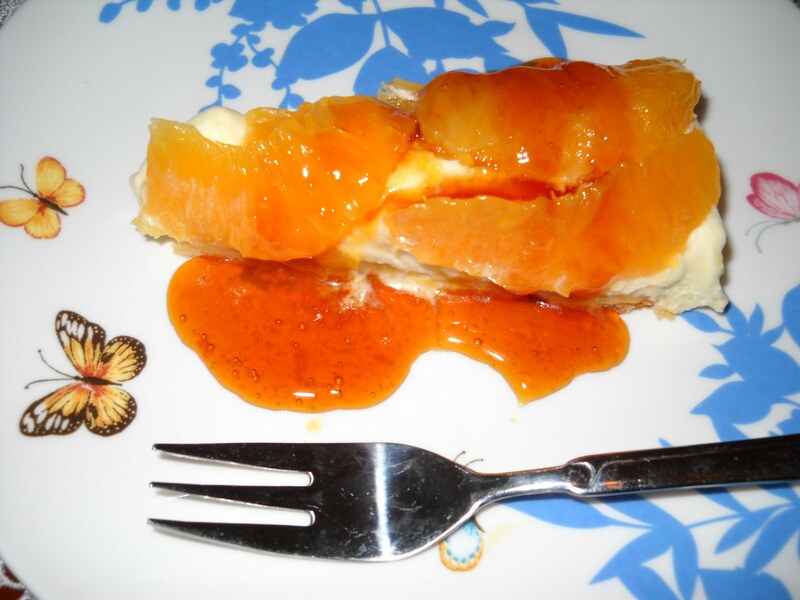 I didn't need to use pectin or jam setter to make this marmalade - the time tested ratio of 1:1 fruit:sugar worked just fine by itself. You place the jam side of the biscuit base down on top of the cream in the mould, then you freeze the whole thing for around 20 minutes (as mine was a large one - smaller versions need only 10 minutes). I was skeptical about the sauce too, but man it is good! The dessert is made even better by the sauce, so don't skip it. 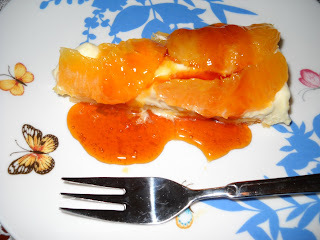 To take a gander at hundreds of other orange and other flavoured tians, visit the Daring Bakers blogroll. 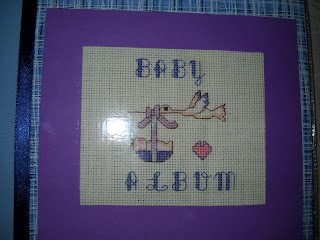 Thanks to Jennifer for introducing me to something new and exciting this month, which I otherwise would never have known about or made. Last weekend, I was away again, this time in Sydney for a dear friend's wedding. 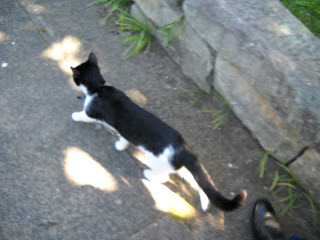 My companion and I took the day off on Friday and made it a three day weekend so that we could make the best of the opportunities that Sydney has to offer. I didn't get to Adriano Zumbo's in Balmain, because we left it til Sunday, and then found that the ferry timetable was rather woeful in meeting our need to do other things and get back in time to catch our return flights, so that was left for another day. 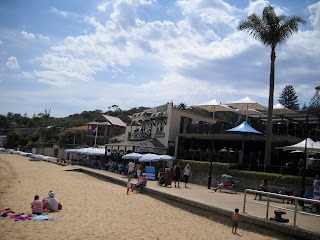 However, on Sunday, we did have a wonderful lunch at Doyles on the Beach in Watsons Bay. 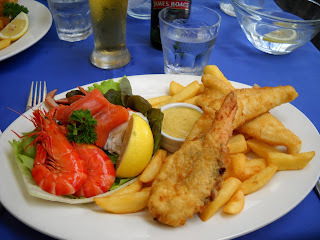 The Doyles name is synonymous with seafood in Sydney, and while there are a number of Doyles establishments, I am informed that the one at Watsons Bay is the original and best. It is pricier than the Doyles cafe nearby, but for the authentic Doyles experience, it is worth it. Mains average at around $40, and entrees are around the $19 mark. I don't own Photoshop, so everything truly is as bright and as sunny and as blue as it appears in the photos. It was a truly glorious day. It may have been autumn, but it felt like summer in every way. Both serves were very generous (we could not have fitted in entree or dessert), and came with soy chilli, tartare and tomato sauces. We washed it down with a Boags beer (in my companion's case) and a Semillion (in my case) while admiring the marvellous view and general holiday ambience. Our bill was just over the hundred dollar mark for two (including a weekend surcharge), but it is not something you do every day, and was a very enjoyable meal. 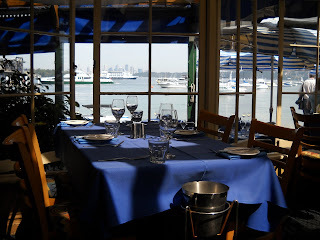 While in Sydney, we also went to the Chinta Ria Temple of Love restaurant in Cockle Bay. 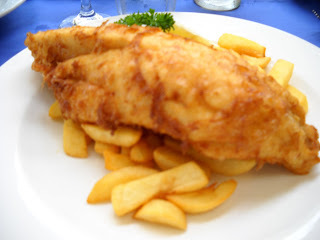 The food was very good, although on a Friday evening, we were lucky to get a table without booking and without waiting long. I recommend booking if possible because it seemed to be a very popular venue. We even did some celebrity spotting, as Angus Sampson (for international readers, he was The Bull in Where the Wild Things Are movie) arrived as we dined. I selected the chilli scallops - and man, they packed some punch - while my companion chose the Sassy Duck (duck in soy sauce). We had Pisces Toast (lovely toasts topped with ling, which you dip in sweet chilli sauce) for entree. Again, this was not a cheap meal (just over $100 for two with wine and beer), but it was very good food. 1. Pass it onto seven other blogs you love. 2. Let everyone know seven things about yourself. 3. Notify the awardees on their blogs. 4. 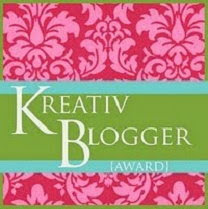 Link to the awardee's blogs when giving the awards. 1. I have lived in 3 states, 2 countries and 2 hemispheres. 2. I did not travel overseas until I was in my mid twenties. 3. I did not fly in a plane until I was sixteen. 5. I cannot live without chocolate - the panacea for everything - and I usually have some every day. 6. I regularly do clinical pilates to help my poor old back. 7. My current favourite shows are Mad Men and The Circuit, both of which are thankfully available on DVD. This week's Tuesday with Dorie is hosted by Jodie of Beansy Loves Cake, who chose Dorie's Dulce de Leche Duos. Not quite the same ring to it, but definitely the same stuff. 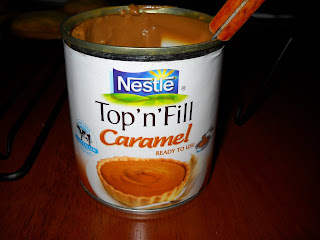 My favourite use for Caramel Top'n'Fill is to eat it straight from the can, and this recipe obligingly left me enough caramel in the tin to do just that. These biscuits are easy to make, although they tend to bake into some odd shapes and sizes. They taste very good, and I'd make them again if it took my fancy. Thanks to Jodie for hosting us this week. 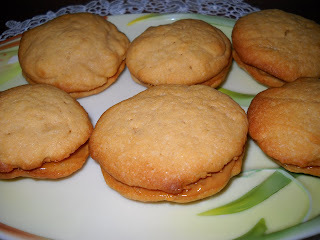 If you'd like some other views on these cookies, visit the TWD blogroll. Hi to all. Sorry I have been a slacker this last week - I have been distracted by all manner of things, including a weekend away in lovely Melbourne, which belied its reputation for bitter weather with summery blue skies and hot sunshine. I ate at some fabulous places while I was there, including Jimmy Watsons in Carlton (salmon pizza with marscapone and salmon roe), Cooper & Milla's in Armadale (banana and date porridge - very thick and substantial - and an enormous lamington), and a Chinese restaurant upstairs in Chinatown somewhere with a 5 course banquet for $32.50 a head that included Peking Duck - yum! (From the photos, I think it was Da Hu Peking Duck Restaurant.) I also had lunch at Cafe Eden in Canterbury - a rather large but lovely honey mustard chicken salad, together with a lime spider. 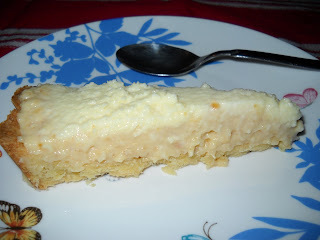 However, I am back and I have as of Monday night made this week's Tuesday with Dorie recipe. Our host this week is Rachelle of Mommy? 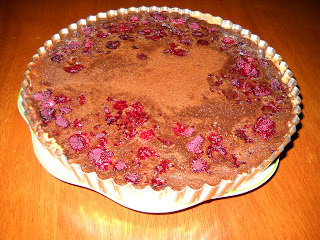 I'm Hungry, and she chose Dorie's Soft Chocolate and Raspberry Tart. A dessert with a name like that has me written all over it, so even though I struggled to fit this into my schedule and in fact made it in about 4 stages, it was worth it. Now don't you just wanna sink your teeth into that chocolate filling? 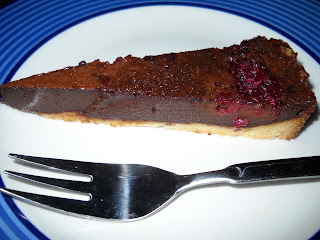 This tart is oh so good, and surprisingly not very sweet. Another week, another Tuesday with Dorie recipe. This week, our host is Mike of Ugly Food for an Ugly Dude. Last week, we learned he was a dwarf warrior called Thaddeus from Dungeons and Dragons. This week, we are told to expect a glorious fanfare because it is his TWD pick. And what a good pick it is - Thumbprints for Us Big Guys. Thumbprints is a US term for these cookies. In Australia, the closest that we have is jam drops, with the same concept, but using a shortbread-style biscuit to drop the jam in, and usually, the jam is put into the cavity before you bake the biscuits. I often got into trouble as a child by being very generous with the jam (the job allocated to me in the jam drop making process), causing it to run over the top of the biscuits and out into the tray. These particular thumbprints are made with ground hazelnuts - I ground my own, husk and all, hence the flecks in my biscuits. 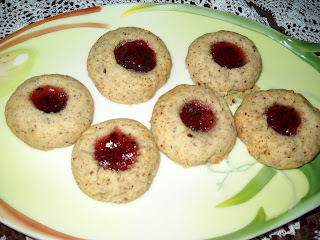 While baking these, I had to remake the "thumbprints", because they tended to disappear as the biscuits rose and spread. These biscuits are very buttery - so buttery that they are a little fragile once fully cooled. The biscuits are allowed to cool completely before you put the jam in. This makes the biscuits look neater than the jam drops to which I am accustomed. I used dragonberry jam for my thumbprints, made from dragonfruit. These biscuits were easy enough to make and fuss free - no chilling of dough, just mix and go. They also tasted very nice - melt in the mouth cookies with that sweet spot of jam in the middle. Thanks to our host, Mike, for this pick. You can check out the recipe on his site. You can also check out the other TWD thumbprint variations by visiting the TWD blogroll. I actually made these over Christmas when I had plenty of time on my hands, as in the hurly burly of every day life, I don't get the time to do projects like this. 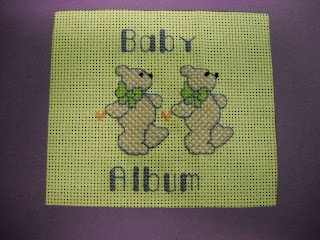 The stitching has a purple hue, because I didn't know whether the babies would be girls or boys when I made these; as it happens, they are both boys. 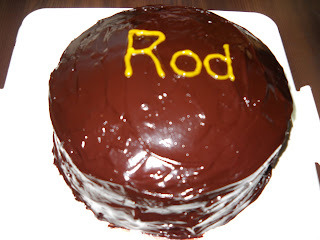 On Wednesday, it was my boss's birthday, so in time-honoured fashion, I made him a cake. 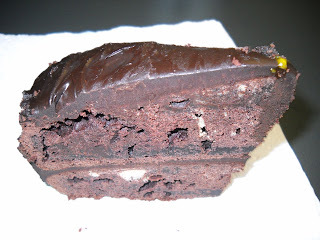 I have no idea what his favourite type of cake is, but I know he likes chocolate, so I chose to make him one of the chocolatiest cakes I could find - Devil's Food Cake with Midnight Ganache from pp99-103 of Rose's Heavenly Cakes by Rose Levy Beranbaum. This cake is possibly the most chocolatey chocolate cake around - it relies mainly on cocoa in the cake and ganache for its strong chocolate flavour and dark appearance, although there are 200g of chocolate in the ganache to help things along. 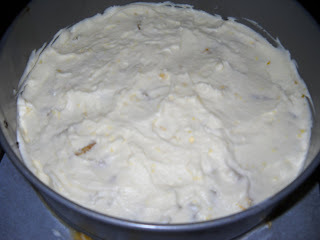 I hadn't realised it when I made the cake, but Rose had posted some minor amendments to the method for making the cake on her blog, because in her words, I found it a bit too tender". If this means it breaks easily, I'd have to agree. one of my layers had deep crack on top, and when I turned it out of the pan, threatened to split in half. The other layer was not as problematic, but I'd wish that I had read Rose's instructions prior to making the cake, because I was using the ganache as a glue for the cracked layer. The ganache is made with a caramel syrup - it is a little time consuming, but the end result is worth it and oh so good. Someone at work complained that they found this cake too rich - I guess it all depends on what you like and how big a slice you have. 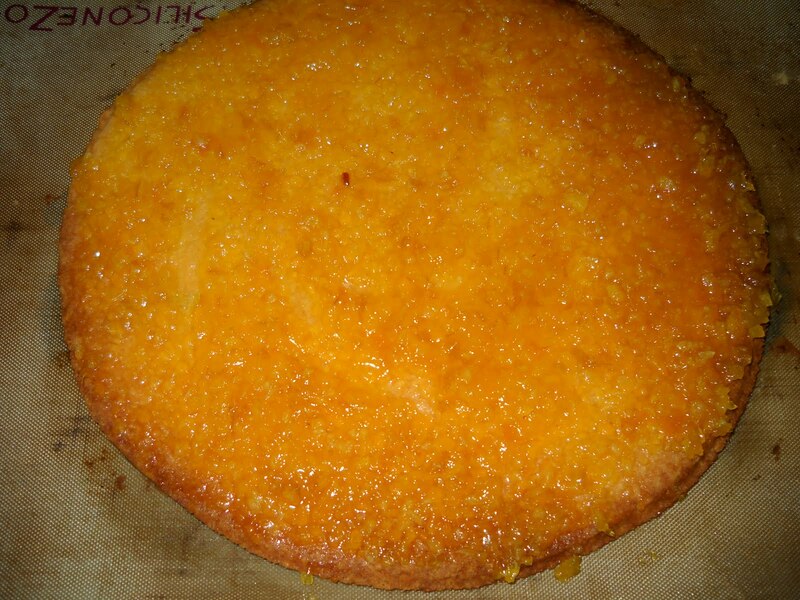 I had a small piece, and enjoyed it very much, but I include the comment in case you aren't a fan of very rich cakes. Line, grease and flour 2 x 9" cake tins. Put the chocolate, cocoa and boiling water into a bowl, and whisk together until smooth. Leave this mixture to cool to room temperature after covering the top of the bowl with cling wrap (~ 1 hour). Whisk the eggs, egg yolks, sour cream, vanilla and half the cooled chocolate mixture together in a bowl until just combined. Put the flour, sugar, bicarbonate of soda and salt together into the bowl of an electric mixer, and beat together on low speed for ~ 30 seconds. Add the butter and the rest of the chocolate mixture, and mix together on low speed until the ingredients are moistened, then increase the speed and beat for 30 seconds. On medium-low speed, add the egg mixture to the batter in two parts, beating between each addition and scraping down the bowl as necessary. Pour half of the batter into each of the prepared cake tins, and bake the cakes for 30-40 minutes or until cooked through. Whisk the cocoa and boiling water together until smooth, and allow to cool to room temperature in a covered bowl (~1 hour). Chop the chocolate very finely in a food processor. In a saucepan, stir together the sugar and water until the sugar is moistened, then place the saucepan n the stove over medium high heat an stir it continuously until the sugar has melted and the mixture has started to bubble, brushing down the sides of the pan with a wet pastry brush as necessary. Once the mixture starts to bubble, stop sirring, and allow it to continue to boil until it reaches 188 degrees Celsius on a candy thermometer and has turned a deep amber colour. At this stage, remove the mixture from the heat, and slowly and carefully, add the cream. Be careful, as the mixture bubbles up when the cream is added. Return the pan to the heat, and stir the mixture until the caramel is fully dissolved, then remove it from the heat and stir in the butter in small pieces until it is fully incorporated into the mixture. Pour the syrup into a jug or container with a pouring lip. Once the ganache is ready, put one of the cakes onto a cake disc or plate, and spread one cup of ganache on top of that layer. 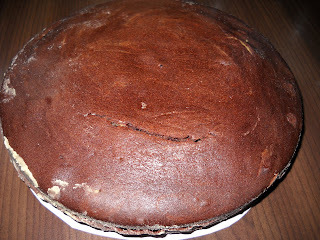 Put the other cake layer on top of the ganache, then coat the entire cake with the remaining ganache. Mmm, custard tart ... 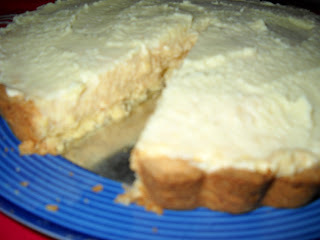 This week, our Tuesday with Dorie host, Beryl of Cinemon Girl, chose Dorie's Toasted Coconut Custard Tart. This custard tart is nothing like Lionel's beloved custard tarts in "As Time Goes By". Rather, this tart is a coconut-and-rum-flavoured pastry cream extravaganza topped with rummy whipped cream. 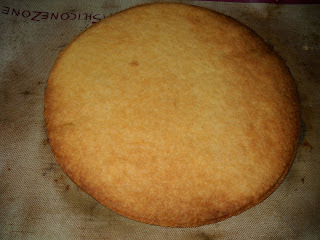 And here is the final product with whipped cream topping prior to cutting. To see what the other TWD members thought of this tart, visit the TWD blogroll. 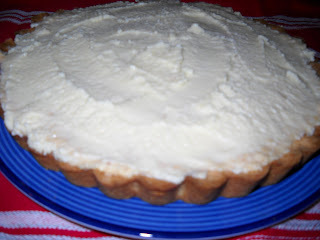 If the thought of a rum and toasted coconut tart is too hard to resist, you can buy the book or visit Beryl's blog for the recipe. February's The Kitchen Reader book is Paula Deen's memoir, It Ain't All About The Cookin'. 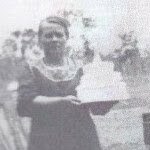 In Australia, we are not exposed to Paula Deen, but I did have a vague idea of who she was through reading other people's blogs, and knew that she was famous for using lots of butter in her cooking. Paula's story is very inspiring. Hers is a true case of rags to riches off the back of her own labour (and with some help from loyal family and friends), with a bit of risk taking along the way that paid off. Paula's business grew from delivering sandwiches to Savannah offices through The Bag Lady business, to the multi-million dollar restaurant, television and publishing empire that it is today. Paula has even appeared in a movie (Elizabethtown), showing how far she has come from the cheerleader who fell in love with the wrong guy and married him against her parents' wishes. Along the way, she conquered the loss of her parents, a lack of funds, agoraphobia and a shiftless husband. Paula's book is no holds barred - she even discloses some of her own dirty laundry, inviting the reader to make their own judgements. I personally liked her more for disclosing that she isn't a saint, unlike the many sanitised celebrities that enter our loungerooms. 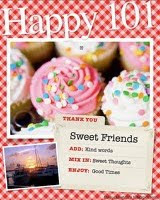 As Paula says, telling secrets is a great gift you give to others - tell a secret, get one back. She also refuses to pretend to be someone she's not. For example, in the Foreword, Paula states that she is a cook, not a chef. When she gets her own cooking show, Paula's Home Cooking, and her producer asked her to take "princess bites", she refuses, and tastes the food as robustly as she would in her own home. The book is peppered with some of Paula's most famous and favourite Southern recipes, many of which sound delicious - who could go past a good beef stroganoff or Mississippi mud cake? I have bookmarked the recipes (because there is no recipe index), and hope to try some of them one day soon. I love the fact that Paula involved her family in her enterprises so that her businesses are true family businesses. Their involvement was not always willing (at least in the case of her sons), but it gave them an opportunity to grow and prosper together as they overcame the odds to build up a successful food empire. The importance of family is evident throughout the book, and Paula's belief in this fact helped her to deal with the initial rejection of her step-daughter on her second marriage. Despite the very serious subject matter that is raised in Paula's book, her story is told with a sense of good humour. There are also some great characters in Paula's life for whom she has a very evident affection - her second husband, Michael, and her producer, Gordon Elliott, are standouts. I enjoyed It Ain't All About the Cookin' a lot. I admire Paula's gutsiness, initiative and obvious zest for life, and I think I could learn a lot from her in those respects. I could imagine there are plenty of people who might not like Paula's style, which is forceful and no holds barred, but I think she's a pretty amazing woman, and I am so glad that we got to read this book. If you would like to hear other perspectives on this book, check out The Kitchen Reader blogroll.